“Why do I tour?” VC Swag Giveaway! Home/Contests/“Why do I tour?” VC Swag Giveaway! With tryout season coming up quickly, we decided a VC swag giveaway was in order! Here at the Ultimate Experience, we cater to you, the Ultimate player that seeks to be better. There is a story behind the multi-weeknight leagues, the tournament-packed summer, the hard work and the laughter. We want to know what you love about it! Share your favourite photo of you playing Ultimate or doing something Ultimate-related on Facebook, and a short description of what you enjoy about club touring. Think outside the box! Share a memory at a tournament, on the road, on the field, or the friendships you’ve made over the years. Tag The Ultimate Experience and hashtag #UEgiveaway on Facebook to enter. Winners will be selected every Monday starting March 6th, 2017 until March 27th. Each single post counts as a single entry and if not chosen, will count towards the following week’s draw. If we like your post, you may get re-shared on our Facebook page! 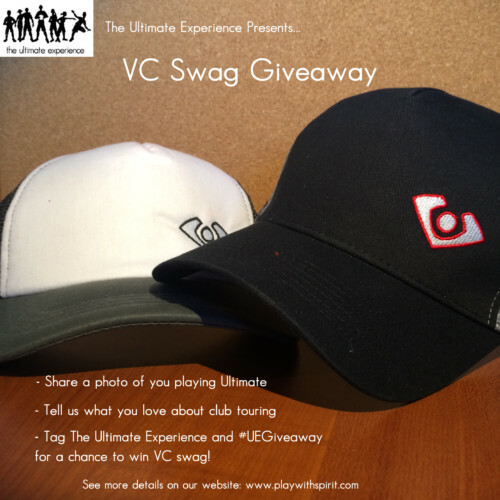 VC Ultimate – Tryout Giveaway! Layout Ultimate – Mixed Division Giveaway! Layout Ultimate – Open Division Giveaway!